This article is about the 1988 film. For other uses, see Coming to America (disambiguation). In the fictional wealthy African nation of Zamunda, crown prince Akeem Joffer grows weary of his pampered lifestyle on his 21st birthday and wishes to do more for himself. When his parents, King Jaffe and Queen Aeoleon, present him with an arranged bride-to-be, Akeem takes action. Seeking an independent woman who loves him for himself and not his social status, Akeem and his best friend/personal aide, Semmi, travel to the New York City borough of Queens and rent a squalid tenement in the neighborhood of Long Island City under the guise of poor foreign students. Beginning their search for Akeem's bride, they end up invited by some locals to a rally that is raising money for the inner city. During the rally, Akeem encounters Lisa McDowell, who possesses all the qualities he is looking for, and upon his insistence he and Semmi get entry-level jobs working at the local fast food restaurant called McDowell's—a McDonald's ripoff—owned by widower Cleo McDowell, Lisa's father. Akeem's attempts to win Lisa's love are complicated by Lisa's lazy and obnoxious boyfriend, Darryl Jenks (Eriq La Salle), whose father owns Soul Glo (a Jheri curl–like hairstyling aid). After Darryl announces their engagement—without Lisa's consent—to their families, she starts dating Akeem, who claims that he comes from a family of poor goat herders. Meanwhile, although Akeem thrives on hard work and learning how commoners live, Semmi is not comfortable with living in such meager conditions. After a dinner date with Lisa is thwarted when Semmi furnishes their apartment with a jacuzzi and other luxuries, Akeem confiscates his money and donates it to two homeless men. Semmi wires a telegraph to King Jaffe for more money, prompting the Joffers to travel to Queens and expose his identity as a prince. Cleo, initially disapproving of Akeem as he did not want to see his daughter with a poor man, becomes ecstatic when he discovers that Akeem is actually an extremely wealthy prince after being introduced to the Joffers. When Akeem discovers that his parents have arrived in the United States, he and Lisa take shelter at the McDowell residence where Cleo welcomes them. After Cleo's bond with Akeem is ruined by Darryl's unexpected arrival, Lisa later becomes angry and confused that Akeem lied to her about his identity. Akeem explains that he wanted her to love him for who, not what, he is, even offering to renounce his throne; but Lisa, still hurt and angry, refuses to marry him. Despondent, Akeem resigns himself to the arranged marriage, but as they leave, Jaffe is reprimanded by Aeoleon for clinging to outdated traditions instead of thinking of his son's happiness. At the wedding procession, a still-heartbroken Akeem becomes surprised when his veiled bride-to-be is Lisa herself. Following the ceremony, they ride happily in a carriage to the cheers of Zamundans. Witnessing such splendor, Lisa is both surprised and touched by the fact that Akeem would have given it up just for her. Akeem offers again to abdicate if she does not want this life, but Lisa playfully declines. Murphy also plays: Randy Watson, a soul singer with the fictional band Sexual Chocolate; Saul, the white Jewish barbershop customer; and Clarence, the owner of the barber shop. Hall also plays: Reverend Brown; Morris the barber; and Extremely Ugly Girl, an unattractive female clubgoer. Madge Sinclair as Queen Aoleon, Akeem's mother and the Queen of Zamunda. The cast also includes: Vondie Curtis-Hall as Basketball Game Vendor; Garcelle Beauvais as a royal Rose Bearer; Victoria Dillard as a royal personal Bather; as well as the film debuts of Ruben Hudson as Street Hustler and Cuba Gooding Jr. as Boy Getting Haircut. Don Ameche and Ralph Bellamy reprise their roles as Mortimer and Randolph Duke respectively from Landis' 1983 Murphy-starring comedy film Trading Places. A segment of the Trading Places score can be heard during their scene. As shown above, Coming to America features Murphy and Hall in several different roles, of various colours, creeds and genders. Following the success of this film, this became a Murphy staple, as seen in four later films: Vampire in Brooklyn (1995); The Nutty Professor (1996); Nutty Professor II: The Klumps (2000); and Norbit (2007). We had a tussling confrontation… We didn't come to blows. Personalities didn't mesh. ... He directed me in Trading Places when I was just starting out as a kid, but he was still treating me like a kid five years later during Coming to America. And I hired him to direct the movie! I was gonna direct Coming to America myself, but I knew that Landis had just done three fucked-up pictures in a row and that his career was hanging by a thread after the Twilight Zone trial. I figured the guy was nice to me when I did Trading Places, so I'd give him a shot… I was going out of my way to help this guy, and he fucked me over. Now he's got a hit picture on his resumé, a movie that made over $200 million, as opposed to him coming off a couple of fucked-up movies – which is where I'd rather see him be right now. Paramount cancelled press screenings of the film after initial negative reactions to a press screening in New York. 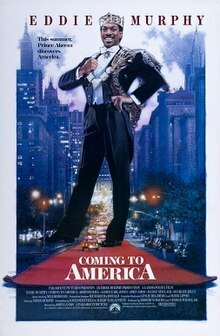 Coming To America received positive reviews upon release. Review-aggregation website Rotten Tomatoes gives the film a score of 67%, based on reviews from 42 critics with an average rating of 5.9/10. The website's critical consensus reads, "Eddie Murphy was in full control at this point, starkly evident in Coming to America's John Landis' coasting direction." On Metacritic, the film holds a weighted average score of 47 out of 100, based on 16 reviews, indicating "mixed or average reviews". The film was the subject of the Buchwald v. Paramount civil suit, which the humorist Art Buchwald filed in 1990 against the film's producers on the grounds that the film's idea was stolen from his 1982 script treatment about a rich, despotic African potentate who comes to America for a state visit. Paramount had optioned the treatment from Buchwald, and John Landis was attached as director and Eddie Murphy as the lead, but after two years of development hell Paramount abandoned the project in March 1985. In 1987, Paramount began working on Coming to America based on a story by Eddie Murphy. Buchwald won the breach of contract action and the court ordered monetary damages. The parties later settled the case out-of-court before an appeal going to trial. The soundtrack to the film was released on LP, cassette and CD. The songs "Coming to America" by The System, "Better Late Than Never" by The Cover Girls and "Come into My Life" by Laura Branigan and Joe Esposito were released as singles from the album. "That's The Way It Is" by Mel & Kim had been released as a single in the UK, before the film's release, in February 1988, and became a top ten hit. It was released as a single in the US at the time of the film's release. A television pilot of a weekly sitcom version of the film was produced for CBS, following the film's success, starring Tommy Davidson as Prince Tariq, and Paul Bates reprising his role as Oha. The pilot went unsold, but was televised on July 4, 1989 as part of the CBS Summer Playhouse pilot anthology series. In early 2017, an announcement was publicized which addressed the impending production of a sequel to the film. Kevin Misher was named as producer, and Sheffield and Blaustein, the original screenwriters, were also attached to the project. However, a possible participation of lead actors Eddie Murphy and Arsenio Hall was left undefined. According to several public accounts, Murphy himself apparently posted an announcement regarding the film project a month prior on Facebook, but later claimed that his account had been hacked and completely deleted it. On January 11, 2019, it was announced that the sequel will be moving forward with Murphy reprising his role and Craig Brewer as director (having previously worked with Murphy on the Netflix film Dolemite Is My Name). Arsenio Hall, Shari Headley, John Amos and James Earl Jones are expected to return for the sequel as well. ^ "Coming to America (1988)". Box Office Mojo. IMDb. Retrieved March 29, 2019. ^ a b Fitzpatrick, Molly (April 11, 2015). "Reminder: A terrible 'Coming to America' TV pilot happened in 1989". Splinter News. Retrieved September 28, 2017. ^ Carlson, Daniel (May 5, 2009). "Is it Just Me, or Does Every Woman in New York Have a Severe Emotional Problem?". Pajiba.com. Retrieved July 3, 2011. ^ "The Collider Interview: John Landis, Part II". Collider. February 9, 2005. Retrieved July 18, 2009. ^ Obenson, Tambay A. (April 5, 2013). "When Paramount Withheld 'Coming To America' From The Press, Not Knowing What They Had". IndieWire. Penske Media Corporation. Archived from the original on May 12, 2013. ^ Easton, Nina (July 26, 1988). "WEEKEND BOX OFFICE : 'Rabbit' and 'America' Battle for Dollars". Los Angeles Times. Retrieved January 1, 2011. ^ Easton, Nina J. (January 5, 1989). "Nice Guys Finish First : Roger Rabbit' Hops to Box-Office Top; 'Coming to America' Hits 2nd". Los Angeles Times. Retrieved October 26, 2010. ^ "Coming to America". Box Office Mojo. IMDb. Retrieved April 2, 2011. ^ "1988 Domestic Grosses". Box Office Mojo. IMDb. Retrieved April 2, 2011. ^ "Coming to America (1988)". Rotten Tomatoes. Fandango. Retrieved June 29, 2018. ^ "Coming to America Reviews". Metacritic. CBS Interactive. Retrieved June 29, 2018. ^ Benson, Sheila (June 26, 1988). "Spare Fare in Eddie Murphy's 'America'". Los Angeles Times. Retrieved October 26, 2010. ^ Canby, Vincent (June 29, 1988). "Review/Film; African Prince in Queens". The New York Times. Retrieved October 26, 2010. ^ "The 61st Academy Awards | 1989". Oscars.org | Academy of Motion Picture Arts and Sciences. Retrieved February 22, 2018. ^ Thane Rosenbaum,The Myth of Moral Justice: Why Our Legal System Fails to Do What's Right page 182. ^ Thane Rosenbaum wrote, "In 1995, the syndicated columnist Art Buchwald prevailed after a seven-year legal battle against Paramount Pictures, claiming that he had submitted the idea, and the original script, for the Eddie Murphy film, Coming to America, without ever being properly compensated or acknowledged for his efforts. The trial court eventually agreed with Buchwald, although the damage award that he received was considerably less than what he had sought, and even less than what he eventually had to pay out in legal fees." --The Myth of Moral Justice: Why Our Legal System Fails to Do What's Right page 182. ^ "`Outtakes' - `Coming To America' The TV Series". Deseret News. December 8, 1988. Retrieved August 12, 2011. ^ "Ludacris's 'Coming 2 America' - Discover the Sample Source". WhoSampled. Retrieved February 22, 2018. ^ "Ludacris - Coming 2 America Lyrics". MetroLyrics. CBS Interactive. Retrieved February 22, 2018. ^ a b "'Coming to America' sequel makes headway as Paramount hires original writers to pen script". Daily Mail. April 13, 2017. Retrieved April 17, 2017. ^ Falcone, Dana Rose (April 14, 2017). "A 'Coming to America' Sequel Is in the Works With the Original Writers". Us Weekly. Retrieved April 17, 2017. ^ Burwick, Kevin (January 11, 2019). "Coming to America 2 Is Officially Happening with Eddie Murphy". MovieWeb. Retrieved March 29, 2019. ^ Jones, Monique (January 11, 2019). "'Coming to America 2' Is Officially In The Works As Sequel Gets A Director And Plot". Shadow and Act. Retrieved March 29, 2019. Films produced by George Folsey Jr.